Norwegians tend to go from being sociable outdoors people during the bright days of summer to people who practically hibernate indoors as soon as the cold air of autumn grips the country. Daniel Rybakken is no exception. However, his interest in light wasn’t sparked by winter depression but a discovery he made while sitting in the living room of his mother’s house. He was intrigued by how the room could change from being pleasant and airy during the day to cramped and claustrophobic by night. Ten years later, he’s making a living by recreating something as natural as daylight. Technically speaking, Daniel is a light designer whose main focus is on daylight and how to artificially recreate its appearance and subconscious effect. It all began in an unused room at his mother’s house. He hoped to recreate the daytime feel of the room, which was usually lit by a traditional incandescent ceiling lamp at night, by placing a fluorescent lamp behind drawn curtains in the living room. He discovered that the false daylight broke down the boundaries between the four walls and the rest of the world. Daniel thinks these boundaries may be why people from the north tend to experience darker moods during the winter—we feel more locked in and alone. In the summer, the boundaries are more fluid and we feel more at one with the outdoors. This is a very medical approach to the importance of light, and his design undoubtedly functions on a deeper level than do traditional lamps do. "Over the years I’ve reformulated the term ‘function’. As a student, I was taught that function should be ergonomic, and that art was exempt from function. This is the classical, old-fashioned way of thinking. I think function is so much more than that. I mean, a message you want to convey and communication itself might be functions. As for my lamps, it’s about more than just having enough light for me to read the newspaper, it’s about how I feel. I try to create specific moods and associations. These are functions that are just as important as being able to read a newspaper," Rybakken says. Daniel work has received recognition worldwide. 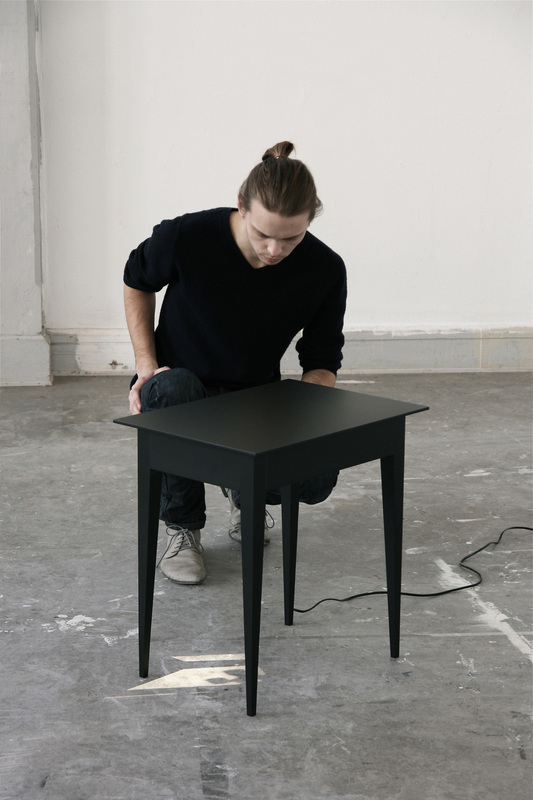 These are just a few of his award-winning designs: A table that projects a graceful pattern of shadow onto the floor. Blurred, semi-transparent ‘windows’ that create an illusion of natural daylight and suggest objects outdoors through the use of dynamic artificial shadows. A mirror that creates reflections and casts shadows on its surroundings. Creations where the light source is hidden, creating a mysterious effect, a subconscious effect of daylight. The common denominator of these concepts is that they’re always based on the actual light rather than on sculptural design, which tends to be the way that other lamp designers work. Rybakken’s design is meant to communicate with the viewer on a subconscious level, which means that everything has to be done correctly. If you’re in your apartment and a light strikes your wall, what is it that makes you perceive this as daylight and not just as a spotlight or a car driving by? People just know without having to verify it, and Daniel has to know why. This is what he finds most complicated about his work: it’s difficult to understand how natural light behaves. His work has to be very hands-on. Despite his interest in light, Daniel hasn’t put much energy into his own home in Stockholm. 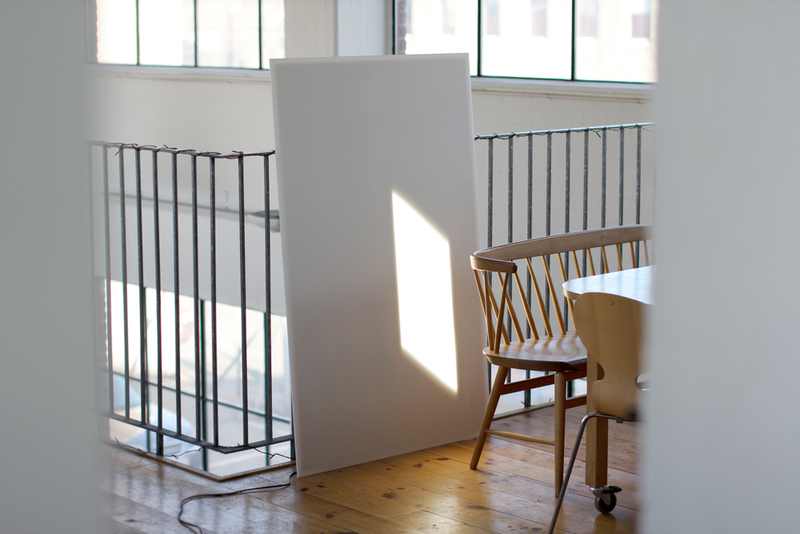 His studio, however, has ten-foot windows and his desk bathes in daylight. Although right now Daniel isn’t spending that much time in the studio as he’s currently on paternity leave. Being at home with his newborn has put his work on hold for the time being, and he finds the working situation less than ideal. "Right now I’m working one day a week, which makes it difficult for me to get into the various projects. And there’s so much else to do. People think designers are drawing and building models all the time, but I also have to give interviews, coordinate exhibitions and everything else you do to look after your freelance business, like bookkeeping." Shortage of time is no obstacle to Rybakken, who mysteriously get things done. He’s going to launch a new lamp in Stockholm the week after this interview, and he has an exhibition coming up in Milan a month from now. And if everything goes to plan, he’ll be launching his first furniture designs during the year—his most advanced project to date. But Daniel doesn’t want to overemphasize this. "The goal is to create. That’s what I’m passionate about. I collect good projects and I want to continue to do that. Which is why I can’t work too quickly as that would result in inconsistent quality. And I want the worst thing I’ve done to be insanely good." As the son of two designers, Daniel can’t remember a time when he didn’t want to be one himself. But he can also remember a time when he wanted to be an inventor—not a traditional inventor, but one who combined function with visual communication and aesthetics. Looking at what he’s accomplished so far, he feels certain that he’s become one.